Kwek-kwek... there's something uniquely Filipino about that term. Who else would come up with such a comical word for this popular street food? It just shows how much fun we are! The alternative name for it - Tukneneng - is just as memorable! Kwek-kwek is simply quail egg dipped in orange batter and deep-fried. Really good when dipped with vinegar! I just came across the above photo while going through my archives and I couldn't help but smile. You could say that the kwek-kwek was one of the highlights of our trek to Mt Manabu in Batangas two years ago. We woke up that day to overcast skies but we still proceeded with the trip. We hoped that the day will eventually turn for the better but we arrived at the top wet and muddied. And it did not let up even that night. Only when we were leaving the following morning did the fog lift and we were able to finally see some views. Mt Manabu was supposed to be one of the more beautiful trekking destinations but the weather let us down. It was fun, nonetheless, getting stuck in such a weather with friends. 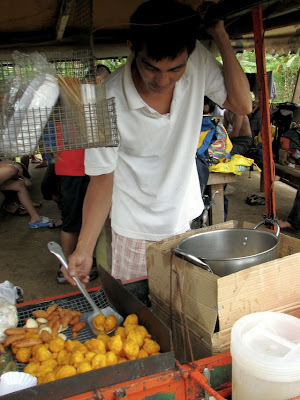 And when we finally arrived at the foot of the mountain, we saw this vendor selling kwek-kwek! We were back in civilization :-). My favorite street foods are fishball and kwek kwek! Especially with sweet and spicy sauce, yum!